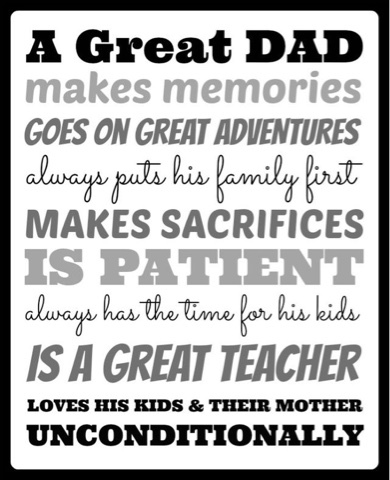 Anyways with Father's Day coming up I am reminded more and more today why I love my husband, the father to my 3 children! My husband has been a friend for so many years, that when our lives collided in another way it all just melted into a perfect family. I love my husband because from day 1 neither him or his family treated my 2 children from my first marriage any different. They were his babies, their grandbabies, their nephews, nothing more and nothing less. He held them when they cried, changed their diapers, helped me potty train them, read them bed time stories, and healed their wounds. Remember as Father's Day approaches being a dad is more than just DNA, being a dad is putting your heart in soul into loving a child, DNA has nothing to do with being a real father.